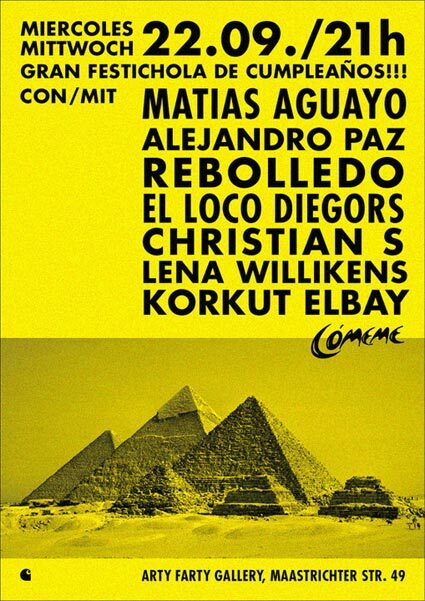 During the next weeks Carhartt presents the European autumn tour of the Cómeme family. Before they hit the clubs with their peerless dance rhythms between Cumbia madness, Disco deepness, jacking House mania and crazy Shangaan Electro they celebrate the initiation of their upcoming trips with a little bash in their temporarily hometown Cologne. Behind the recordplayers, electronic machines, congas, and microphones: Matias Aguayo, Rebolledo, Diegors, Alejandro Paz, Korkut Elbay, Christian S, and Lena Willikens. More to follow about the European Cómeme rythm attacs soon at this point.